As part of PepsiCo’s weeklong Super Bowl activities, the PepsiCo Foundation has announced a $1 million donation to the Bob Woodruff Foundation, a nonprofit serving veterans and their families. A check-and-a-handshake ceremony will occur during a January 31st event hosted by Jon Stewart and feature Blake Shelton. The event will be live-streamed and include a click-to-donate button for viewers to contribute to the cause. 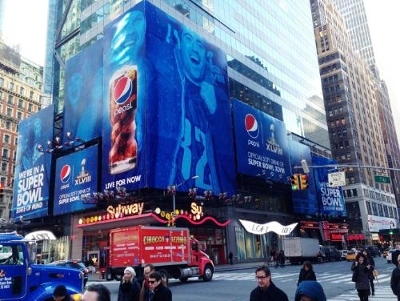 Pepsi’s making a huge Super Bowl splash this year as the sponsor of the halftime show and taking over New York City’s Bryant Park in the days leading up to the main event. The Stewart/Shelton event is just one of many featured entertainment acts. Coming from the brand that forewent Super Bowl spending in 2011 and instead granted $20 million out via its now defunct Pepsi Refresh effort, this cause tie-in is incredibly traditional. It’s disheartening to see such an cause innovation u-turn from Pepsi with this effort that includes only minimal consumer engagement and intrigue. On the flip side, any Super Bowl attention given to a worthy cause is always invaluable and could prove to be hugely lucrative for the Bob Woodruff Foundation financially and boost the charity’s reach and awareness. Is this reversal-toward-conservatism a trend we’ll be seeing more of from large consumer brands? Weigh in with your comments below! What a great stage with the Superbowl to present the check for $1,000,000 but I wish there was more of a forum for the rest of us to donate money.